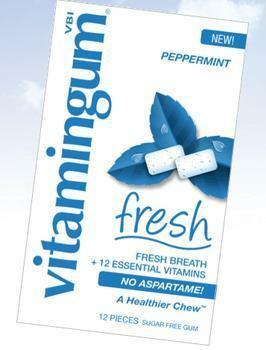 Vitamin-enriched chewing gum -- an aid for dieters and athletes? A few days ago we reported that Wrigley was introducing caffeinated chewing gum, which is true. But we then went on to say it was surprising there was no vitamin-enriched gum, gluten-free gum or antibacterial gum. Wrong again. In fact, there is at least one brand of vitamin-enriched gum. It's called -- what else? -- vitamingum, and it's being promoted as a healthful alternative to fatty snacks. The company says its raspberry lemonade flavor contains Vitamins A, C and E, B-Vitamins, calcium and Vitamin D plus minerals. All that, it says, can help dieters fight off snack cravings. "Whenever you get the urge to munch on unhealthy, fatty snacks, munch on two pieces of vitamingum and give yourself some of the nutrients lost when calorie counting," the company's promotional literature advises. Nutritionists, of course, would add that the best way to get vitamins and minerals is through a balanced diet that includes lots of fresh fruit and vegetables, but you already knew that. An advantage of chewing gum as a delivery vehicle for caffeine, nicotine and vitamins is that absorption occurs much more quickly through the tissues of the mouth than through the digestive tract, the path followed by pills, drinks and solids. The company says vitamingum is the only patented, nutrient-enhanced chewing gum and comes in two additional flavors -- grape pomegranate and peppermint ice. All vitamingum formulas are sugar-free and designed to be chewed by people of all ages, the company said, adding that one pack is equivalent to the nutritional value in two 20-ounce bottles of the most popular nutrient-enhanced water beverages. You may have trouble finding vitamingum, but parent company Vitaball, Inc., says it has ambitious expansion plans. "We don’t have the marketing power of Wrigley or Cadbury and thus having trouble gaining distribution in a market dominated by these two behemoths. But, we hope to make inroads in 2013," company vice president Regis J. Nesbitt told ConsumerAffairs. If you just can't wait, you can buy it online. In fact, vitamingum is not alone. We found several other suppiers of chewing gum with vitamins, minerals and "nutraceuticals" added, most of it from foreign lands. 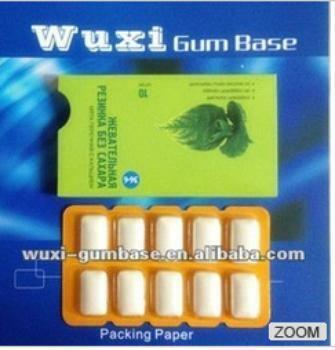 The international bazaar Alibaba.com is a regular chewing gum supermarket. There you can order a product described as "Energy Chewing Gum,Sugar Free Chewing Gum,Caffeine Chewing Gum" for just $2.15 per kilogram. The minimum order is 2 tons, though, and the shelf life is 18 months so you'd have to chew fast. Oh, and just to set the record straight. Here's where you can find gluten-free gum. We didn't find any antibacterial gum, although there are plenty of antibacterial toothbrushes and mouthwashes.